I have always been fascinated with textiles. While living in the PNW I learned about traditional Japanese cotton and bast fiber fabrics and developed a love for these textiles. After moving to NC I now have the ability to grow my own cotton, ramie, and indigo in my garden and gather wisteria, kudzu and other fibers and dyes from the local environment. I also collect antique and vintage fabrics from Japan, China, and South East Asia and I love learning about traditional methods of creating hand spun and hand woven textiles. These handmade textiles show an attention to detail and a grit not often found today. Obi with silk warp and paper weft. Thank you for the You tube on different fabrics and cultures. Am wondering about some fabric have that think is Japanese (not very wide, looks like wild or noil silk in a red,black and grey plaid. Maybe you might know more about it than found online so far. How is your fiber processing going? Tried flax several times , snails got to it and overetted (in 2 days as so hot here). I am a landscape architecture student and am working on a thesis related to invasive species, with a particular focus on Kudzu and alternative uses. I would love to talk to you more about your work. Is there an email address where I can direct questions? Have always wondered if some people use the Kudzu in the south USA. Isnt the root edible? Thought it was an ingredient in some noodles had eaten(udon or soba). well, i’m pleased to find your blog! i can’t imagine why i never knew you were working with shifu and other bast fibers! this is great. i will keep coming by to check in. I am very happy to find this blog. You sound like you are interested in collecting the same types of things I am interested in! I love your photo of the daifukucho. Thanks, I bought some more daifukucho in Tokyo back in July. I love paperconnection.com and use your paper for my shifu projects. How are your Kudzu and wisteria processes going? 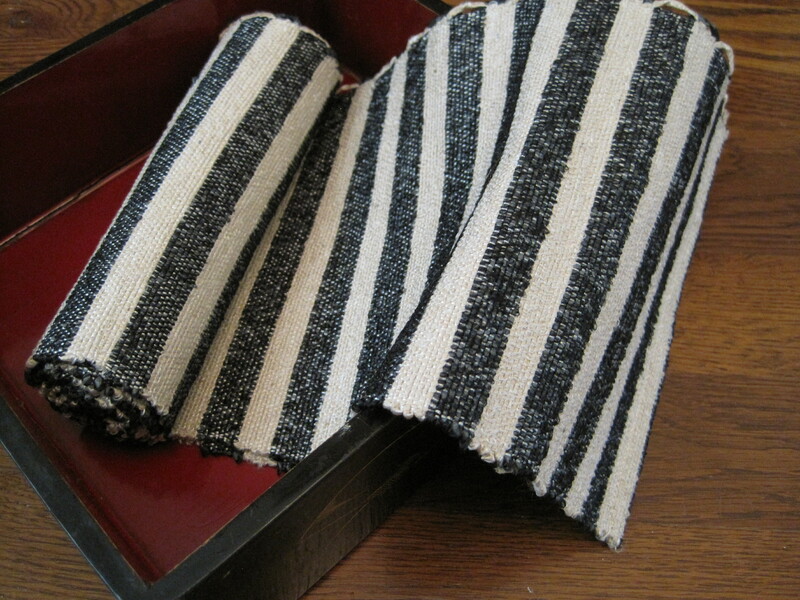 Found a class being taught to make a boro bag so looked up the name and found Japanese rice bags ( tsunobukuro ) mentioned. Wondered if you have collected any and if they have a special type of seaming or regular, running stitch, overcast, if right sides together or like a jean type seam? There are three main types of Japanese bags. Storage bags which are generally made from solid cotton or hemp and often decorated with a family crest. Tsunobukuro are used for storing or carrying grain and are very utilitarian. These bags are sewn on the bias to add additional stretch to the bags seams. I think your class might be focusing on the small decorative bags used to carry gifts of rice or beans to temples during new year celebrations. These bags are often decorated with piecework and decorative stitches. Most traditional sewing for clothing and utilitarian items employ parallel rows of stitches. One line of basting stitches and a parallel line of much tighter running stitches closer to the edge of the fabric.